The growing popularity of cloud apps means enterprises have to rethink indentity management. 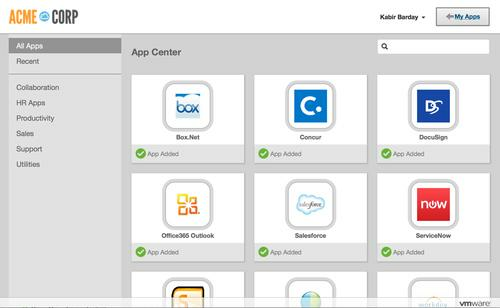 VMware's Identity Manager platform comes with a self-service to simplify app installation. VMware is hoping to convince CIOs to centralize single sign-on access to all kinds of apps with Identity Manager, which can run in the cloud or on-site and also offers application provisioning and a self-service catalog. For better or worse, the switch to cloud-based services on a larger scale and the introduction of bring-your-own devices is forcing enterprises to rethink most aspects of how IT is run. Part of that change is how users are authenticated and given access to applications. The transformation from a client-server, perimeter-based infrastructure to a cloud-based model requires taking on systems outside of the firewall, according to VMware. To help tackle this, the company has launched Identity Manager. Enterprises can choose between an on-site version of the software or a cloud-based service hosted on vCloud Air. The initial launch uses U.S. data centers, but hosting in European and Asia Pacific regions will be offered from the third quarter. Features include the ability to configure different access rules for managed and unmanaged devices, and access to apps can be turned off instantly to protect data. Unsurprisingly, Identity Manager has been tightly integrated with VMware's AirWatch management suite to offer additional functionality. For example, the system can detect when a user successfully unlocks a smartphone or tablet and take that into account for authentication. The core technology behind Identity Manager has evolved over the past three years from Horizon App Manager and later Workspace Portal. The latter is still available, but will be replaced by a future version of Identity Manager, VMware said. Current Workspace Portal subscribers will be entitled to Identity Manager on-site releases, according to an FAQ. Identity Manager is now available as part of the Blue and Yellow Management Suites and will soon be offered as a standalone product, according to VMware. Pricing starts at US$150 per end user, per year. The easiest way to test the platform is to apply for an AirWatch trial where the complete system can be provisioned in the cloud, the company said.